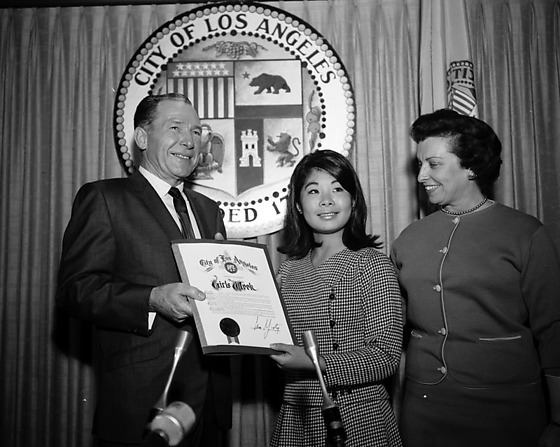 Los Angeles Mayor Sam Yorty presents "Girl's Week" formal proclamation to a young Japanese American woman at Los Angeles City Hall in Los Angeles, California, 1966. 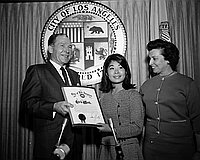 1N: Caucasian man in suit, left, and Japanese American high school student in check suit hold proclamation between them as a Caucasian woman in suit looks on, right. Los Angeles City emblem in background. Microphones in foreground. 2N: Mayor Yorty speaks with a Japanese man and tall Caucasian man in front of Los Angeles City emblem. Microphones in foreground. Typed on original envelope: Youth in Civic Government.